Planning an adoption is a big decision that ideally all members of the family should be in agreement with. Occasionally, a couple’s biological children might be in opposition to adding a new member to the family via adoption. In those cases, it’s important to figure out why they are in opposition, what might be able to be done to educate or persuade them otherwise, and what kinds of behavior or issues the parents might expect if they proceed in their planning to adopt. There are ways to help your whole family prepare for an adoption and survive the transition period after a new child comes home. With strategies to support all of your children and the understanding that, as the adult, you are better equipped to make these kinds of big decisions for your family than a child is, you can successfully integrate an adopted child into your existing family. Why are they in opposition? There are a number of reasons why biological children of all ages, even adult children, could be reticent about having a new adopted sibling. For younger children, these are often the same fears and concerns you see when adding to the family through any means: Will my parents still have time for me? Will they still love me? Will this new sibling get all the attention? For these concerns, your best bet is to purchase a book that talks about the process of a new sibling coming home. It doesn’t need to specifically be adoption-related, but any book that you find that you feel aligns with your values and that your child would enjoy reading, either by themselves or with you. Assure them that you will try your best to make sure any special time they have with you now will remain unchanged after their new sibling arrives. As you continue through the adoption process, reassure your child that your heart has infinite room to love more children and that any love you give a new child will not be subtracting any love from them. For school-aged children and adolescents, they might have more nuanced concerns. They could be concerned about how the adoption process works, practical matters, such as where the new child will sleep, or worries that a new child will interfere with their usual activities. What if the birth parents come to “take the baby back”? Do I really have to share a room with my sister now? Will Mom still have time to take me to dance practice three times a week? These are all concerns older children may have about how the adoption process will affect them. If you are adopting an older child, either internationally or through the foster care system, your child might also have concerns about how this will affect their social life at school and elsewhere. If you are adopting a child who is close in age to your other children, they might be concerned that their friends will like this new child more than them or that they might suffer some social stigma by association if the new child is not immediately well-liked. Teens, especially, are so very concerned about the delicate balance of their social standing that an “intruder,” even if it is their new brother or sister, could be seen as problematic. For all of these concerns, there are age-appropriate ways to discuss them with your child. There is information you can give them that can help educate them about the adoption process and help them feel like they are part of your adoption journey rather than just a bystander. Enlisting your children in helping to create your profile book, for example, can help them feel that this adoption is a group effort and not something their parents are “doing” to them. Adult children of parents considering adopting often have practical concerns that may be more focused on your well-being than theirs. They may be concerned that you are overextending yourself financially, or that you might be “pushing the limits” in their mind of what the maximum age for a new parent should be. With adult children make sure to reassure them that this is all thought out and not just a midlife crisis or a result of empty nest syndrome. Assure them that you have planned financially for this child’s future, including beyond your lifetime. Discuss with them what the plans for this child would be in the event of your passing. It may sound morbid or excessive, but understand that your adult children are just being protective of both your well-being and their own. If you would like one of your adult children to be the godparent or guardian of this child in the event of your passing, make sure you discuss this with them fully and don’t take it personally if they are not up for the task. Adult children are often focused on their education, careers, or starting their own family. Reassure them that this new sibling would in no way hinder their own plans. How can you help your children adjust to the idea of a new adopted sibling? Throughout the process assure your children that they are allowed to ask you questions of any kind, whenever they need to, and that they will be met with understanding on your part. For example, if you are adopting through foster care, a child might wonder about what circumstances led to the adopted child being separated from his or her biological family. Teens who are more emotionally mature might also understand that this separation undoubtedly caused the adopted child some degree of trauma. However, they may be afraid to ask you what kinds of potential challenges their new sibling faces. Assure them that there are no “off-limits” questions, and give them whatever information you can to help answer those questions. Again, consider the emotional and developmental maturity of your child when providing these answers. A teenager can process, for example, that the birth parents might have committed crimes that led to the family’s separation. A 6-year-old, however, doesn’t have the skills to understand this kind of information, so it would better serve them to tell them that the birth parents were not capable of caring for the child without going into too much detail. Most adoption processes are full of ups and downs, and things can change quickly. Part of helping your children feel connected to the process is being open with them. For example, some parents choose not to tell their children if a disruption occurs, or they choose not to tell them anything about a placement until it is a certainty. While I understand these parents are simply trying to protect their children from any possible emotional suffering, even the youngest of children are able to pick up on your emotions. Your youngest might wonder why you are clearly upset and don’t seem to want to tell them why. At the beginning of your process, make sure you explain to your children, whether they are excited about the adoption or opposed to it, that there is a degree of uncertainty in the process and it requires some patience. Be up-front with them about what the timeline might look like, but make sure to emphasize that every adoption story is different, just like all of their birth stories were different, and that there’s no real way to completely predict when this new sibling will be arriving. What can you expect from your biological children after you adopt? Most children will respond to the addition of an adopted sibling the same way they would to a biological sibling. They don’t particularly care about the origins of this new person that has disrupted your family dynamic, just that it has in some way been disrupted. You may be surprised to find that the child you expected to have adjustment issues will be enthused about a new sibling, whereas your “easy-going” child might have stronger feelings than you anticipated—perhaps they feel “demoted” by this new family member. Many adoptive parents go into an adoption doing a lot of research about how to help the newly adopted child adapt and attach to the family, but it is also important to do some research ahead of time on strategies to help your existing children adapt. It might be beneficial to meet ahead of time with a family therapist to give everyone a safe space to express their concerns and to continue to meet with a therapist after your new child has arrived to try to sort out any issues that might arise. Sometimes, your agency or lawyer will have a referral for a therapist in your area who is well-versed in adoption-related issues. Local adoptive parent groups might also have recommendations. You can also often find therapists by Googling some combination of your geographic area with words like “adoption,” “therapist,” or “counselor.” If you do not live in a very populated area, you might need to think regionally rather than locally. While it is not ideal to have to drive an hour to see a therapist, having a therapist who is competent in adoption is crucial. Unfortunately, some therapists, and even psychologists or psychiatrists, still have outdated or inaccurate ideas about the adoption process and what it entails. Even worse, some still abide by the inaccurate assumption that all adopted children are in some way troubled or that any problem an adopted child might have is a result of their being an adoptee. You can be more assured that you will find someone who is a good fit to address your family’s unique needs by finding a therapist with specific experience working with adoptive families. While we all want our children to be happy, the bottom line is that there are some decisions that are not theirs to make. While it is important to ensure they are educated and feel included in the adoption process, one of your biological children expressing disapproval shouldn’t be a reason to stop your adoption process if it is truly how you wish to grow your family. Think of it this way: would you ask your children for their “permission” to get pregnant? Probably not. In the same vein, you, as the adult in the household, get the final say in important adoption decisions. You can work with your children to answer their questions and help assuage their fears about adding a new member of the family via adoption, but if they are still showing signs of displeasure, then this might be a good time for them to learn the lesson that life can’t always go exactly how they want it to. Make sure, during the process and after your new child is home, to carve out one-on-one time for each of your children so they can all have a chance to share their thoughts with you and to feel connected with you. 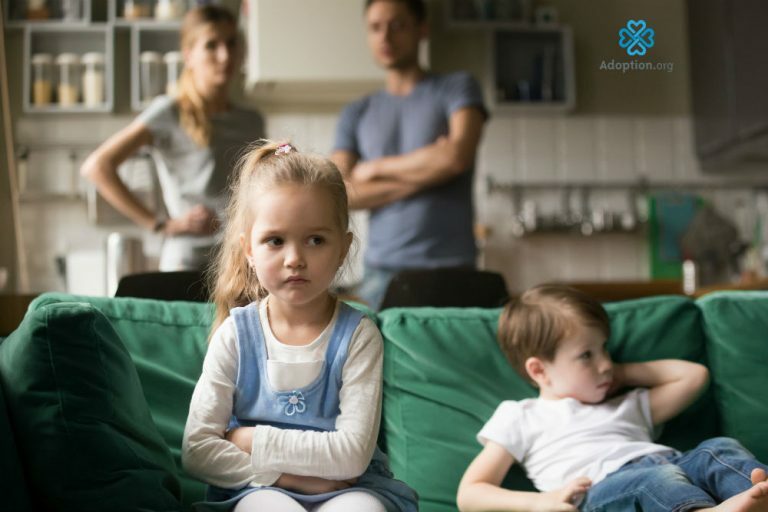 Often, adoptive parents who report their adult family members were in opposition to their adoption plans, remark that all their concerns and negativity seemed to magically evaporate once the new family member arrived. After all, it’s hard not to love a baby or an older child. By further building your family through adoption, you are giving your biological children a valuable lesson: connection and love are not determined solely by DNA. Grafting new, diverse branches onto your family tree will help your children understand that “different” doesn’t equal “lesser” and that no matter how a person’s story started, they have the power to overcome adversity through hard work and the loving support of others. The transition might not be smooth and your children might take some time to warm up to their new sibling, and vice-versa. However, if you are prepared for it and understand this phase of your family’s life won’t last forever, you can make it through the uncertain and difficult times toward the future you had envisioned for your family complete with your new child who joined your family through adoption.